When my great grand mother, Sophie Skinner, was born at Bream Creek on 11 September 1867 she had three elder sisters Ellen (born 1856), Frances (born 1859) and Liza (born 1864) and an older brother William (born 1861). William and Mary Skinner had two more children following Sophie, Lilie (known as Mary) in 1870 and Joseph, who was born in Hobart, in 1873. Ellen(Nell) Skinner, who was born on 26 March 1856, married Michael Thomas Connor in 1874. He was the son of Michael Connor and Elizabeth Lucas and when sixteen worked as brass founder. They were married at St David’s in Hobart 16 Nov 1835 with witnesses John and Edith(Elizabeth) Eddington. The Eddingtons were probably the children of another Norfolk Island woman Margaret Eddington and Elizabeth’s father was Tasmania’s first Governor David Collins. Nell’s mother-in-law was born in Hobart in 1816 and was a member of the Lucas family that pioneered the Kingston district in 1808. Her grandfather Thomas Lucas, was a marine in the First Fleet who married Ann Howard, a convict on the Lady Juliana, on Norfolk Island in 1801. They died at Kingston and are buried in St David’s Park Hobart. Her father, Thomas II was born in Sydney in 1791 before his parents moved to Norfolk Island. Thomas II arrived in Hobart in 1808 on the City of Edinburgh with his wife, the former convict Elizabeth Blinkworth, and his parents. His younger brother Richard (b 1795) became the second husband of Elizabeth Fawkner, the sister of the founder of Melbourne John Pascoe Fawkner. Thomas Lucas established a whaling station at Adventure Bay on Bruny Island in 1825 and four years later formed a partnership with Captain James Kelly. The pair had other stations including on Slopen Island and Maria Island. Michael Connor II was born in Sydney in 14 September 1801, became a mariner, and arrived in Hobart around 1825. His father, also Michael Connor, was formerly a soldier who was convicted of stealing an iron bar in London in 1788. He escaped from Newgate Gaol to care for his wife Elizabeth, and three children. For his escape he was transported for life. He came to Sydney on the Scarborough , and his family was allowed to travel on the Neptune. However only wife Elizabeth and son Roger made the trip. Both ships were part of the Second Fleet that arrived in June 1796 after a horrendous voyage in which many died. He was granted a conditional pardon in 1797 and after receiving a grant of 80 acres at kissing Point became a successful farmer. Later he served briefly in the New South Wales Corps and as a constable at Government House Windsor. In 1828 ‘he moved to Van Dieman’s land where he had a son and daughter whom he had not seen for several years’ . For a time he lived in Elizabeth Street near the Ship Inn and despite being 83 years old petitioned the Governor for position as his pension of a shilling a day was not sufficient for his support. He apparently remained active and energetic until his death seven months later in December 1829. He was buried in St David’s Churchyard. At the time of his father’s death Michael Connor II, was the Mate on one of Kelly’s ships, the Mary and Elizabeth. When it returned to Hobart in April 1832 he is listed as the mate and the ship’s cook as George Connor; probably his brother. There were two other brothers, George and Charles and a sister Margaret who were born in Sydney between 1794 and 1804. Michael was master of the 106 ton schooner Hetty in 1835 and engaged in whaling around the coast of southern Tasmania. In 1840 he took command of Thomas Lucas’ new 130 ton schooner Two Sisters. Between 1842 and 1844 he was in command of Lucas’ cutter Mary Ann and master of the schooner Prince of Denmark. In November 1835 Michael Connor II married Lucas’ daughter Elizabeth. The couple lived in Battery Point in the street named after James Kelly. It seems he gave up the sea around 1849 and is recorded as hiring eleven convict women between June 1849 and 1855. Perhaps they were servants. Michael Thomas was their first child of Michael II and Elizabeth Lucas born on 7 September 1837 on the Two Sisters while anchored off Hunter Island or at 27 Harrington St. Shortly afterwards he paid his father-in-law £100 for some land that James Kelly had developed on Battery Point. Charles William was born in May 1840 and Thomas in Oct 1842. But then things went wrong. Charles died aged two less than three months before Elizabeth gave birth to Thomas and his father buried the boy in St. David’s churchyard and erected a headstone in his memory. A daughter, Ada, was born in 1845 and their fourth son, George, in October 1848. When George too died as a boy of four he was buried near his brother and his headstone remains in St David’s Park. At this time Michael was working as a whaler. By this time Michael’s parents were both drinking heavily. When George died his father became depressed and in August 1853 fell out of bed whilst drunk and struck his head on a table. Elizabeth had been in the habit of remaining in bed all day and was apparently too drunk to do anything about it. Michael Thomas was then sixteen and working as a brass founder but came home for his meals that were cooked by Anne Brown. He seems to have been largely responsible for caring for everyone including his eight-year-old sister Ada. After lying ill for some days Michael ignored his parent’s protests and summoned Dr Stokell but it was too late and his father died the next day. John Eddington also gave evidence at the inquest held at the nearby Prince of Wales Hotel. Michael’s brother Thomas does not figure in the inquest so it appears that he may have already left Hobart. Neither is there mention of a male child whose birth in May 1852 was registered. Michael Connor II was buried in St David’s Churchyard along with his sons George and Charles William but apparently Elizabeth was unable to erect any memorial to him. Perhaps Elizabeth regained her spirits after Michael’s death with the help of her brother-in-law William Field (husband of Sarah) for 29 May 1855 she remarried. He new husband was her neighbour, an English boot-maker named George Baker; both were thirty-eight when they exchanged vows at St. Georges Church Battery Point in the presence of Robert Watson and Elizabeth Files. They continued to live in the house in Kelly Street and Elizabeth’s second daughter – Emma Sarah, was born there on 17 December 1856. In 1872 she married another mariner Charles John Beck at the residence of a Mrs Robertson 102 Collins Street. Elizabeth died at her home of cirrhosis of the liver on 23 July 1870. In 1857 the convict James Harrison was assigned to the Lucas family property at Kingston. Joseph Thomas b 1875 m Amy Isabel Fitch (1873-1949) 13 April 1903. Their first son was Albert Joseph (1905-1993). Minnie Elizabeth Fie b 1877 m William Percy Wakeham (1874-) in 1898. First child Beryl Ilma b 1899. Michael William Lucas (known as Bill) b 1879 m Jun 1903 Violet Alvia Tate (1881-1948) one of ten children of Thomas and Clara (Hay). Michael Charles Lucas, known as Charles, b 1887 married his sister-in-law Clara Lucy Tate (1885-1971) in 1910. Their first son Colin Lucas b Nov 1914. Cyril Tasman b 1890 m Evelyn Elizabeth Lewis in 1905. In the 1884 Council roll of ratepayers says the house was occupied by the Connors. Michael Connor died in December 1892 but Nell continued to live at 24 Kelly Street until her death in November 1916. In 1903 and 1906 she is listed on the electoral roll as a nurse. They and their daughter Sarah were buried together at Queenborough cemetery. Joseph and Elsie married a brother and sister (Fitch) and Bill and Charles married sisters (Violet and Clara Tate). Bill became a shoe repairer in Hampden Road Battery Point and lived next door at no.51. His business operated until the 1920s. He was a keen yachtsman and wood carver. I don’t know whether it was the shop started by his step-father. Charles was listed in the Post Office Directory in 1920 under the Victoria Trading Company 91 Liverpool St. After he died in 1927 (or perhaps a bit earlier his wife seemed to run the shoe shop in Hampden Rd. Connor’s shoe repair business still operates with two shops in the city and one at Glenorchy. Joe lived in Queen Street Sandy Bay until the 1920s when he moved to 1 St Canice Avenue in lower Sandy Bay. Joseph was quite a contrast to the rest of his family being ‘an artist of some distinction” (Scrivenor 2007). He was ‘ a small bright eyed-man a dealer in silver, fine china and antique furniture, he was surprisingly modern in outlook. A member of the forward looking Society of Artists in Sydney, he shocked conservative Hobart in 1928 when his painting ‘The Blue Boat’ was hung with acclaim at the Paris Salon. (Max Angus 1966). In their book Fifty Years of Painting in Tasmania 1925-75, Don and Maggie Row devoted many pages to the life and work of Joseph Connor and judge him as the most important artistic figure in the State during those years. His son Albert founded the drapery A J Connor Pty Ltd in November 1923 it grew into one of the city’s five major Department stores. Located in Harrington Street between Victoria Street and Liverpool Street the site is now the Spotlight store. The lady in the front row is Amy Connor (nee Fitch), wife of the artist Joseph. 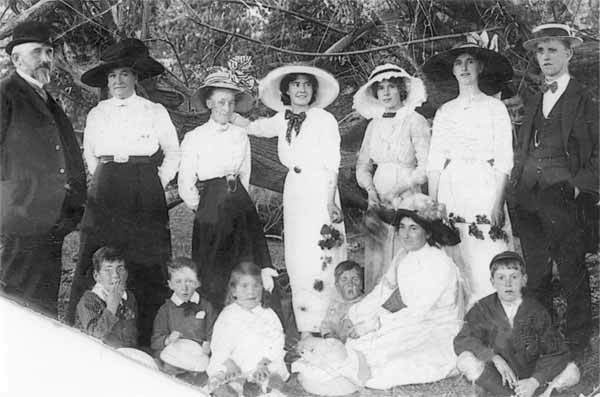 Her son Bert (AJ Connor is at the left hand end of the front row., his sister Kathleen is the girl in that row. The man on the left of the back row is Owen Tudor, Amy’s brother-in-law. Fanny's interesting life is in the next chapter.